The rumble of thunder and flashes of lightning late yesterday weren't just another storm rolling into Naples--it was fanfare for the opening of the Garden's virtual garden on the web. The new website debuted with lots of photos of the construction, background on each of the future Gardens, an area where you can post your own photos (Sally Richardson has posted pictures of her mangos), a detailed look at green building practices being used in the expansion, as well as staff blogs. Blogs, short for web blogs, are commentary, descriptions of events, etc., in this case about the Garden. Blogs by Brian Holley (listed as director's) and Chad Washburn's (listed as preserve) will appear every other week or so; mine (listed as gardens), every week. In fact, the weekly Insider Update email provides the content for the gardens blog and eventually will disappear as an email. In a few weeks, the only way you will be able to read this is to go to the gardens blog at naplesgarden.org. In the director's blog, Brian Holley talks about the competition to name the swamp buggy, the camouflage-covered buggy with four wheel drive, a dump bed and winch to use for maintaining the preserve areas. Send in your suggestions for naming the buggy by September 15 by clicking on the "contact us" at the bottom of the page. The prize is a personal tour of the natural areas and construction site for three people with Chad Washburn. I've attached one of the latest aerial pictures of the expansion. The Garden's existing building is in the upper right hand corner. According to Chad Washburn, the gray swaths are dead melaleuca (Melaleuca quinquenervia); the green areas are scrub habitats. 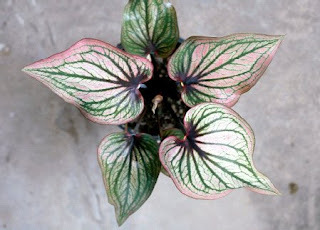 After last week's rave about new Thai caladiums, I had to share a photo of one. It's Siam Moon. The leaves are white with a pink blush and green veins. We have it planted in part shade in the Pink Courtyard. Carolyn Miller has promised to take more photos I can share next week. How many times can a person misspell a word and get away with it? It seems indefinitely. It came to my attention that baobab (Adansonia sp.) ends in -bab, not -bob. I blame middle-age eyesight for part of the problem. In the non-virtual Garden, the sweat and toil continues. 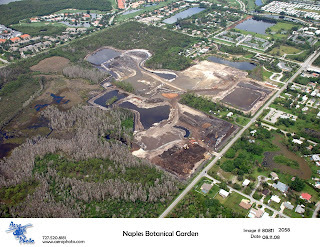 The shifting of the nursery to a nearby new site was completed successfully, allowing the perimeter berm to wrap around the odd-shaped corner by Palmetto Drive and Thomasson Drive. That task involved replanting our row of bananas, putting down new ground cloth, installing irrigation and, of course, moving hundreds of plants. Nursery foreman Kurt Van de Wouw worked tirelessly to get that done before he left on vacation. Volunteer Dave Catron assisted Kurt. Dave Catron and his wife Sandy continue to volunteer at the Garden at least one day a week. Dave spends whole days weeding, potting, building a potting bench, whatever is needed, hence his nick name "super Dave." Meanwhile, Sandi is working miracles on the orchid collection, organizing, repotting, and nurturing. The other big effort around the Garden continues to be renewal pruning. This time of year is perfect for cutting back over-lush foliage and branches. (Although in the case of fruit trees, pruning needs to be done after the harvest.) Gardener Carlos Lopez attacked the plants outside the wall along Thomasson Drive. The shrubs, especially the firebush (Hamelia patens) had become so large that the sidewalk was crowded and impeded motorists' view when leaving. If you're interested in who's who in the horticulture department, take a look at the attached photo. In the back row from right to left is Brian Galligan, Horticulture Manager; Kurt Van de Wouw, nursery foreman; Chad Washburn, Natural Areas Manager. In the front row (r to l), Carolyn Miller, curator of collections; myself and Carlos Lopez, Horticulture Staff.